Schloss Hetzendorf is a medium-size, Baroque palace in the district of Meidling (12th district of Vienna). It is one palace of its kind out of dozens in Vienna alone - yet fairly well-known as home to a fashion and design school, the only school of this genre in Austria. Hetzendorf itself was once a village that is now long part of Vienna; the parks of the Palace are open to visitors only at special (usually advertised) occasions, the palace aka Modeschule Hetzendorf (the school) is not accessible for common folk (ie non-students of the school). You can walk around in the courtyard, though - as I did when I took the pic above. A few words on the history of Schloss Hetzendorf: At the onset of the Baroque bloom of Vienna - in 1694 - Count of Thun hired one of the most famous architects of his time to design a new countryside retreat for the Thun family: Johann Bernhard Fischer von Erlach. The little palace was meant to serve as a hunting chateaux and ensure the Thuns of direct access to Schloss Schönbrunn Palace, where the Emperor resided. The palace that Fischer von Erlach designed, became known as "Thunhof". After 1712, three other architects helped to re-model the Thunhof: Fischer von Erlach′s nemesis Lukas von Hildebrandt, Anton Ospel and Antionio Beduzzi. They transformed the Thunhof from a hunting chateaux into a fancy Gartenpalais, a playful palace with extensive gardens ideal for representation. The garden became particularly famous among Vienna′s aristocrats, and the Thun family made good use of them by organising balls and receptions there - including a legendary summer ball. In 1743, Empress Maria Theresia bought the Thunhof and once again, the palace was re-modelled: Court architect Nicolo Pacassi added two wings and a chapel. 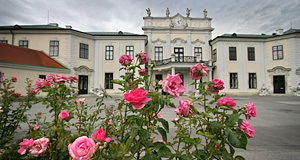 The palace now served as the private residence for Maria Theresia′s mother Empress Elisabeth Christine after her husband had died. Later Schloss Hetzendorf became a retreat from the retreat for the Habsburg family - once that the summer palace of Schönbrunn became to stuffy, members of the Imperial family who could not leave the city altogether would go to Schloss Hetzendorf (and not to Laxenburg, which was even more popular, but too far away to stay in touch with their daily duties). In the 18th century, an alley was set up with trees that would directly extend to the parks of Schloss Schönbrunn at the Small Gloriette. In 1780, Schloss Hetzendorf was sold again, this time to Christian August von Seilern, but the Habsburg family continued to use it - especially for very private visits off the main protocols. The last Habsburg to reside in Schloss Hetzendorf was Emperor Karl I, the last one of the Austrian-Hungarian Empire. The palace′s chapel (which was dedicated to him a few years ago) contains a relic of the Emperor, who was recently beatified and is right on track to become a saint. Attractions nearby are few; Schloss Schönbrunn, the Maria Theresien Kaserne, the cemetery of Hietzing and the ORF Zentrum Hietzing are in walking distance if you are up for a bit of a hike. Otherwise, Meidling is a predominantly residential area.